Robbie Jean Donaldson, age 80, of Joplin, Mo. passed away at 7:21 a.m. Tuesday September 18, 2018. Robbie was born January 25, 1938 in Battle Creek, Mi. 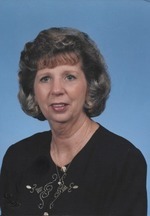 She has been a resident in Joplin since 1968.Robbie worked in Customer service for Empire District Electric Company. She was a member of Forest Park Baptist Church. Robbie married Johnny Donaldson July 6, 1957 in Monett, Mo. and he proceeded her in death on November 27, 2016. Survivors include a son, John Donaldson, Joplin, two daughters, Diana Prater and husband Rick, Wyandotte, Ok., and Deborah Souter and husband Blake, Rogersville, Mo., nine grandchildren, Brandi Dodson and husband Richard, Joshua Locke, Ami Hall and husband Gerod, Jetta Walker and husband Cliff, Shaun Locke and wife Tasha, Brad Prater and wife Janet, Judd Donaldson, Hannah Souter, and Hailey Souter, and 15 great grandchildren. Robbie was also preceded in death by three brothers, and a great granddaughter, Madisyn Jade Walker. Graveside services will be at 11:00 a.m. Friday at Ozark Memorial Park Cemetery with Dr. John Swadley officiating. Burial will follow in the Ozark Memorial Park Cemetery. Visitation will be from 7-8 p.m. Thursday at Mason-Woodard Chapel. Memorial contributions are requested in honor of her husband to the Parkinson’s Foundation in care of the Mortuary.